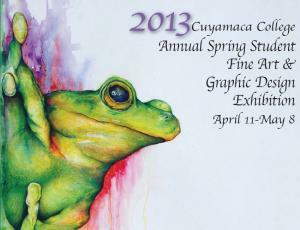 April 10, 2013 (El Cajon)--The 2013 Cuyamaca College Annual Spring Student Fine Art and Graphic Design Exhibition opens Thursday and will run through May 8. An opening reception will be held on Thursday, April 11 from 5-7 p.m. followed by an awards ceremony on the artist veranda. The event will be held at the Community Arts B Building, East Wing, Third Floor on the campus of Cuyamaca College, 900 Rancho San Diegio Parkway in El Cajon. 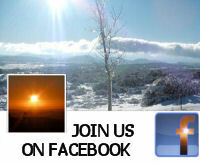 For more information, call (619)660-4027.